also they have built a modern day tower of babel in france - they had a poster which was banned for causing offence to christians which depicts the tower of babel surrounded by 12 stars (inverted pentagrams which are a satanic symbol) and the slogan "many tongues one voice"
Mary Habeck sounds very informed, and I'm sure there are many on the other side who will dazzle us with facts and references to other scriptures. I was only trying to decide whether to go to great lengths to obtain a copy of this book. Dr. Reagan has convinced me it would not be worth the effort. Thank you for this website. When I first read Reagan's article I thought that he had an argument, later I read Walid rebuttal on Prophezine under CHALLENGES. I guess I am convinced that one man arguments [Reagan] sounds good until examined by another [Shoebat] I mean WOW. Reagan has no comprehention on this subject of Mahdi and neither does he even understand Antichrist. I clipped the arguments presented by Walid and what a counter punch. Reagan lacks basic comprehension on Islam and a live debate with him will prove this beyond a shadow of doubt. No serious researcher on Islam would ever write: “In fact the concept of a Mahdi is not even found in orthodox versions of the Hadith like Sahih al-Bukhari and Sahih Muslim…” even worse “there are no confirmed tradition amongst Sunni Muslims that believe in Mahdi.” His article is riddled with “in fact” without any reference to back his views on the subject. We even warned him of this uneducated error before publishing his report and he never heeded any counsel. The Mahdi 17 is well documented in all of the main Hadith collections—Al-Bukhari, Sahih Muslim, Sahih Al-Tirmidhi, Sunan Ibn Majah, Sunan Abu Dawud, and Sahih Al-Nisa'i. (see reference 16). Please don't get me wrong here, your mentor David Reagan has alot to offer and most of his material is good, so let's not get into a debate here, but could it be that your bias towards Reagan is a result of your working relationship with him? Do you think your mentor is immune from error? Was he wrong when he stated that only Shia believe in Mahdi? Was he wrong when he stated that Muslims do not worship a man? Can you honestly state that Muslims do not worship Muhammad? Go ahead, answer these two questions, and like Dirty Harry said "go ahread, make my day"
What you need to learn young lad is never depend on man or look up high towards a mentor--your mentor needs to be the Bible. Muslims do worship a man, your mentor was wrong to say that Muslims do not worship a man. He was wrong in assuming that they will not worship Antichrist. Why not simply admit it? Where is the balance in your publication? I have been very surprised how worked up some folks have gotten over whether the Antichrist will be a Muslim or not. After all, it has nothing to do with salvation, and none of us will know anyway cause we'll be outta here before it happens. I guess all the angst has less to do if their theory is correct, and more to do about whether one loses their audience's respect if their theory is questioned. I can assure the reader that Dr. Reagan and my(autonomous)self are convinced that the Bible, history and current events best support the European Antichrist theory. We also remind the reader that it is only a theory, and that there's a lot more important things to discuss that edify the Body. 2-Why didn't Reagan do a rebuttal on Fruchtenbaums work? Why simply pick on The Assyrian Connection and others? d-you don't respond to questions, then simply go to the first argument-that your theory is correct. I can see Sean's point about Arabia Felix, ok, maybe parts of Arabia was not of the Roman Empire,I can also see bro Shoebat's point that northern Arabia was Romanized. Why not stick to the issues of Eschatology? Instead, we have false accusations to bro Shoebat by using racial slurs like 'your Arab skull' that bro Shoebat still is Muslim and follows Taqyyia. The discussion is about Eschatology and NOT Walid's conversion. It's the fallacy of attacking the character or circumstances of an individual who is advancing a statement or an argument instead of trying to disprove the truth of the statement or the soundness of the argument. In other words, Shoebat called Sean Osborne a pinhead for the sole reason of making a historic error, the Bride of Christ is not stationed in the West, but everywhere. Osborne on the other hand instead of addressing the issue decided to attack Shoebat's credebility as Christian. This type of argumentation is a true sign of a pinhead. only a pinhead would break the church into a western and eastern base, with the west possessing all the knowledge and the east nothing. Sean in his rebuttal ended up adding more to Shoebat's claim that he is a racist. Nathan, why don't you refer people to something more edifying then this instead of wallowing in the mud. Your a nice kid and can do better then this. Just an advice. "Even Jesus insisted that Pergamum (Turkey) in Revelation 2:12-13, was the seat of Antichrist..."
No, I think you have misinterpreted what is stated in this passage from Revelation. I believe sound exegesis reveals that seven churches addressed in the openning verses of Revelation are prophetically symbolic of The Church through the various ages from the Resurrection of our Lord to the 'Last Days" prior to His return. "#1 Why would Sean publish a private email?" Why not? It was sent to me by both Ray Gano and Keith Davies, illustrating "Walid's" most fervent desire that I receive his filthy, ad hominem attacks because I dared to offer a PUBLIC dissenting view to the erroneous exegesis offered by the "eastern leg" clique. Do I not, or anyone else, have the God-given freedom to express a dissenting voice? Apparently "Walid" and Keith Davies do not think so. (Keith Davies has now gone so far as to issue a threat that I dare not to oppose "Walid" and a warning that by "our poking" at the "eastern leg" proponents we will "hurt ourselves" and that to continue doing (i.e. composing written rebuttals) what I am and others doing will cause me to be "sorry" for doing do, that I have "been warned." Magnificent Christian brethren, don't you think so? Talk about a "bully" pulpit. Quite frankly the supreme and sublime arrogance of this "eastern leg" clique borders upon the ridiculous. To continue, I posted that letter due to the very specific nature of it, its vileness, its crudeness and because of the overall way in which "Walid Shoebat" conducted himself with a brother in Christ he does not know and has never met. And because "Walid's" E-mailed response to me is not completely unlike the reaction one can reasonably expect to receive from the totalitarian Islamists he has apparently gone to great lengths to escape and hide from. How distant, really, is he now from his Arab Islamic upbringing? I desired for all who would read my rebuttal to see the real, unapologetic "Walid Shoebat" in a verbatim, un-edited fashion. If my rebuttal embarrasses him and those who follow the sum of his false exegesis, well, then the embarrassment is well deserved. Any potential damage done to his stature is also just as well deserved. I reserved the right to give back to Walid as well and with interest what he unilaterally sent to me. My comments that "Walid" took umbrage with were actually and initially taken from Bill Salus' PROPHECY DEPOT blog. But Walid found no inherent value to respond in that venue, he wanted to insult myself personally, directly. I, like our new President, desired to "spread the wealth around." As for my alleged breaking of the Church into eastern and western branches... you could not be more hopelessly incorrect. When I refer to the Church it is invariably as the unitary Bride of Chist. Period. Moreover, if divisiveness is a sticking point with you then I would suggest that a re-reading of the openning chapters of Revelation where Jesus Christ divides the Church into seven distinct entities. Will you now criticize Messiah for His "divisive" words? Anonymous, if you're going to make such an accusation, provide a link to the proof text on the Sunni proclamation (like some news article not written by Shoebat). Sal, aside from what Mr. Reagan writes, have you read some news article somewhere stating that the Sunni do not believe in al Mahdi? No you haven't, and you will not because the FACT is that they do. We Sunni believe as above, while the Shia'a believe Al Mahdi to be the 12th apostle of Hussain (son of Ali - the cousin of Prophet Muhammad) a saint they worship, they worship Ali and his sons - we don't believe in most of their thinking (ideology). - they have great respect for Ali and his sons more than for Muhammad. They say that Gabriel made a grave mistake by descending on Muhammad instead of Ali. Quote 1: "... the Mahdi will appear at the end of time ..."
Quote 2: "The Prophet said, 'The Mahdi will be one of my descendants; he will have a high forehead and a hooked nose. He will fill the earth with justice and fairness just as it was filled with injustice and oppression, and he will rule for seven years.'" Quote 3: "Towards the end of time, three of the sons of the Khalifahs will fight to get hold of it [the Ka'bah], until the Mahdi appears. He will appear from the East, not from the tunnel of Samarra, as the Shiah claim"
Here is another Sunni reference. In their book, "Al Mahdi and the End of Time" (1997), Muhammad Ibn Izzat and Muhammad Arif, two well-known Egyptian authors, identify the Mahdi from the Book of Revelation, quoting Hadith transmitter Ka'ab al-Ahbar. In one place, they write, "I find the Mahdi recorded in the books of the Prophets… For instance, the Book of Revelation says: 'And I saw and behold a white horse. He that sat on him…went forth conquering and to conquer.'" Izzat and Arif then go on to say: "It is clear that this man is the Mahdi who will ride the white horse and judge by the Qur’an (with justice) and with whom will be men with marks of prostration (zabiba) on their foreheads.... The Mahdi will offer the religion of Islam to the Jews and Christians; if they accept it they will be spared, otherwise they will be killed." (page 16). Quote: "Al-Sayid Sabiq, the Mufti for the 'Muslim Brotherhood,' in his book, 'al- 'Aqa'id al-Islamiyyah,; that: 'The idea about the Mahdi is indeed valid, and is one of the Islamic tenets that one must believe in.' Mr. Sabiq also narrated a variety of traditions relating to the appearance of al-Mahdi (AS) in the above book. "The memorizers (Huffadh) and scholars of Hadith have verified that there are authentic (Sahih) and acceptable (Hasan) reports among the traditions related to al-Mahdi. The majority of these traditions are related through numerous authorities (Mutawatir). There is no doubt that the status of those reports are Sahih and Mutawatir. (They have also verified) that the belief in Mahdi is obligatory, and that it is one of the beliefs of Ahlussunnah wal Jama'a. Only those ignorant of the Sunnah and innovators in doctrine deny it." For the transcription and reproduction of this Fatwa, see, among others, the Introduction of al-Ganji al-Shafi'i, in the book named "al-Bayan," Beirut, 1399/1979, pp 76-79 and in Appendix." Gal 6:9 "Let us not be weary in doing good, for at the proper time we will receive a harvest if we do not give up. therefore as we have oppurtunity,let us do good to all people especially to those who belong to the family of believers"
Concerning Dr. Reagan, you don't get to be VP of an Ivy League university and earn a Doctorate in Political Science because you're a poor professor or researcher. His research is always very thorough and his attitude always agreeable that people can disagree with his conclusions. "Take it or leave it" is his attitude. You've underestimated the man. Concerning the Shi'ite and Sunni concepts of the Mahdi, I've gone into Dr. Reagan's notes and found four pages of references he used in his research on just this small part of his article alone. From experts in the subject like Dr. Damuel Shahidm to Dr. J. Dominiquez to Dr. Jim Eckman and a slew of encyclopedias - they all agree that the concept of the Mahdi is central to Shi'ite eschatology, but disputed and held in low regard by the Sunnis. As there're over a billion Muslims and a number of "denominations" within Islam, it can be understood that there would be wide disagreement over various Islamic concepts among Muslims. If the Muslims can't agree on their own eschatology, then you and I certainly can't get dogmatic about what the overall entire Islamic religion believes on end-time events. Nathan, thank you for your response. I'm not sure if you had a chance to read the Sunni fatwa that was issued in 1976 -- again, this was issued 33 years ago -- that solidified the belief in al Mahdi as mandatory for all Sunni Muslims. http://www.lutonmuslims.co.uk/Signs.htm -- "... the Mahdi will appear at the end of time ..."
http://store.islamicplace.com/bok634.html -- "I find the Mahdi recorded in the books of the Prophets… For instance, the Book of Revelation says: 'And I saw and behold a white horse. He that sat on him…went forth conquering and to conquer... It is clear that this man is the Mahdi who will ride the white horse and judge by the Qur’an (with justice) and with whom will be men with marks of prostration (zabiba) on their foreheads.... The Mahdi will offer the religion of Islam to the Jews and Christians; if they accept it they will be spared, otherwise they will be killed." I would encourage Mr. Reagan to correct the errors he made and issue an update as soon as possible, and to also issue a response to both Joel Richardson and Walid Shoebat's rebuttals. Or perhaps he could engage in a healthy and open debate with either one of them? I don't see "Wikipedia" in the notes section of Dr. Reagan's article. Hi Sal, thank you. I'll take that as a compliment. I am not Joel Richardson but he seems to be a very meticulous and discerning writer. I considering everything I read and then judge what I read based on what the whole of Scripture says. I don't think this issue is a dead horse at all, it is alive and well. I believe it is very pertinent to Biblical eschatology and helps one to understand prophecy in a much clearer light. For the longest time I was guilty of "theological tunnel vision" by looking for something specific according to my own understanding (based off of the opinions of men more than the text of Scripture), but when I sat back and took off the hat of a biased mindset I began to understand a fuller, more complete view of Biblical prophecy. It took time, but sometimes it'll take awhile to "unlearn" viewpoints that I've held for so long. This is what Chuck Missler concluded as well when he stated, "It is essential that we stand back from our presumptions and prejudices and listen carefully to what the Biblical text is telling us. We are living in exciting times, but we need to be diligent in our study of God's Word. The only certain barrier to truth is the presumption that we already have it." 'I have read extensively regarding Islamic eschatology, and every expert I have ever consulted has stated that the conept of a Mahdi is characteristic of Shi'it (sic) thought, and not Sunni. I just consulted Wikipedia, and it confirmed that.'" I am not saying that anyone here is weak-minded -- far from it. The fact that we have different viewpoints on such matters is evidence that we take the time to study the questions and answers, even if it is from just one perspective. But with two perspectives, iron sharpens iron. However, all too often we resist change to positions we've held for years, especially if it is the only position we've ever known. Anything else would seem "heretical" if it challenges our thinking. So I can understand. For me, looking back, I see now that I had that "tunnel vision" because I refused to consider any differing positions and only accepted one possibility. After all, if the visions of Daniel are sealed up until the time of the end, then do you not think that more of prophecy will be understood the closer we approach D-Day? You stated "Concerning the Shi'ite and Sunni concepts of the Mahdi, I've gone into Dr. Reagan's notes and found four pages of references he used in his research on just this small part of his article alone. From experts in the subject like Dr. Damuel Shahidm to Dr. J. Dominiquez to Dr. Jim Eckman and a slew of encyclopedias - they all agree that the concept of the Mahdi is central to Shi'ite eschatology, but disputed and held in low regard by the Sunnis." There is an obvious contradiction in your statements, your boss stated in his article that "Mahdi is strictly a Shi’a belief and is not at all embraced by Sunni Muslims." Now you come up with "they all agree that the concept of the Mahdi is central to Shi'ite eschatology, but disputed and held in low regard by the Sunnis." I see some obvious back peddling here. There is a huge difference between "not at all embrased by Sunni Muslims" and "held in low regard by Sunnis"
You guys would first need to known how to spell your references, its not "Dr. Damuel Shahidm" but Samuel Shahid whom I know personally. I suggest both of you read Apocalyptic Politics On the Rationality of Iranian Policy in which Shahid is quoted and he points your confusion "'Twelver' sect of Shiism is the most important component of the Islamic apocalyptic tradition because it is fundamentally associated with the notion of the twelfth, or Hidden, Imam—something that is absent in the Sunni theological system." Your boss's confusion is that he had focused on the Twelver sect. can help show the poor research Reagan did "The main difference between the Shiite and Sunni view on the Mahdi is that while Twelver Shiites believe that the Mahdi was born approximately twelve centuries ago and still lives on earth, most Sunnis hold that he will be born at a later date. Both Shiites and Sunnis see the Mahdi as fighting Islam’s enemies, but those enemies are defined very differently. In Sunni tradition, the conflict reflects the conflict that mainstream Muslims have with Christians and Jews. Had "Damuel" or Dominiquez and Eckman supported your boss's errors, you would have quoted them. Yet you will never find such quotes, and this is because you both are dead wrong and cannot admit it. Had Reagan been honest when he stated "I have read extensively regarding Islamic eschatology, and every expert I have ever consulted has stated that the conept of a Mahdi is characteristic of Shi'it (sic) thought, and not Sunni. I just consulted Wikipedia, and it confirmed that." It doesn't matter what Ivy League your boss came from, when one is wrong he is wrong. Who started this fight in the first place? Then cried out "persecution" "persecution" "persecution"
Did anyone "bash Dr. Reagan"? Who started writting articles accusing Richardson and others of being "misleading" "unorthodox" "unbiblical" "lone rangers" and an array of false statements? And now you are starting a new attack yourself when you state "The same pompous, shallow attitude is all over Gano's and Richardson's sites, too." When the facts are that Gano published BOTH opinions, Richardson's and Reagans. Perhaps Mr. Sal you can look at the log in your eye and stop being so aggressive--Mitchell never called you tunnel-vision, but perhaps I am about to do so myself. Why don't you simply stop your yelling and give us a sound argument for a change. Anonymous (whoever you are), I think I now understand why I've heard Dr. Reagan doesn't do debates. One side brings out their pages of support for their point, the other pulls out their pages of support for their point, they argue till they're both blue in the face, and nobody's mind is changed. End result of a debate is a bunch of angry, divided Christians. Hardly edifying. I find your constant crying for an apology isn't edifying. Nobody wronged you! Somebody even said Reagan and Goodman are friends!!! It's obvious to all of us that you've taken this whole constructive debate between supporters of a Muslim AC vs supporters of a European AC and turned it into your own personal battle. Let's agree to disagree. And, however some feel Dr. Reagan came across in his articles, it wasn't personal. A good scholarly debate is never personal. Case in point, check out Bill Salus' Prophecy Depot Blog article on how Bill responded to Rodrigo Silva claiming the European Antichrist theory's a work of Satan. Bill's gracious response and links to logical counter-arguments is the tone I'd like to see us all follow on The Christ in Prophecy Journal. Thank you. Nathan, I agree - that we should agree to disagree. However, Dr. Reagan's article regarding the Antichrist and the Muslim connection can easily be viewed as a personal attack against Joel Richardson and Walid Shoebat. For example, Reagan calls Shoebat a terrible writer, unreasonable, illogical, a "Lone Ranger" interpreter who misapplies Scripture. He accuses Richardson of not having a Biblical attitude and of being misleading. I do not believe this to be true about either one of them. And, unfortunately, I would not classify Reagan's article as scholarly -- stating that Sunni Muslims do not believe in al Mahdi alone negates any scholarly classification and causes me to question how thoroughly he read their books. Also, "I find your constant crying for an apology isn't edifying." You said that "a good scholarly debate in never personal". There was never a debate, so what are you talking about. Can you show me the debate? Debate was never an intent by your camp and neither dialogue. If you notice when one points out your wrong scholarly references you are completly silent. To date there are no scholars that agree with Reagan that sunnis do not believe in Mahdi and all you do is show off that Reagan is Ivy Leage and such....this is classic pride, don't you think? This is not the issue and neither did this "eastern" camp cause any division, and while I agree with you that Rodrigo Silva's remarks are wrong "that a European Antichrist is satanic..." and since you brought up Bill Salus blog, if you notice, right from the beginning of his artilce he sets up a divisive camp by stating that "Relatively recently a small circle of individuals have injected into the Christian Church a paradigm shift in Antichrist thinking." This is rather divisive, don't you agree? Is Jonathan Edwards a "small circle"? You know very well that many Bible scholars believed that Antichrist came from the eastern parts. I'd also recommend Sean Osborne's blog Eschatology Today to go along with Bill Salus' Prophecy Depot to those who feel passionate about whether the Antichrist will be a Muslim or not. Sean and Bill have greatly researched the subject of who made up the Roman legions and other minutia. Both blogs welcome comments and have Joel Richardson involved in commenting. Nathan, do you seriously believe that this debate hinges on a post-trib rapture view? May I ask why or how you've come to this conclusion? 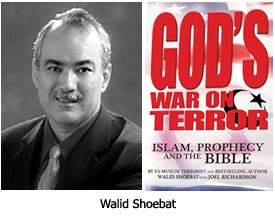 Walid Shoebat is pre-trib, so is Chuck Missler, and I am willing to bet that the growing number of Christians who are beginning to come to the conclusion that Antichrist may be Muslim are pre-trib as well. The rapture question is a completely different discussion.